Asia, and China in particular, is well in the lead of renewable energy job creation, accounting for more than 60% of the world's renewables jobs in 2016. The year 2016 saw an increase to 10 million jobs worldwide in the renewable energies sector. By 2030, the number of people employed is projected to hit 24 million. Aside from reducing the energy sector’s negative impact on the environment, renewables are creating new wealth and are becoming an important job creator for the 21st century. Renewable energies have a great role to play in the transition to clean energy performance and a low-emission economy. That doesn’t mean an underperforming economy, either, as investments in renewable energies, research and development into large-scale projects, and construction and installation all offer significant opportunity for creating jobs. That 10 million jobs number from 2016 is twice as much since the sector was first assessed in 2012, said the Abu Dhabi-based IRENA (the International Renewable Energy Agency). IRENA released its newest report, Renewable Energy and Jobs – Annual Review 2017, stating that sector employed 8.3 million people, excluding large hydropower, which, if included, the total renewable energy job creation number climbs to 9.8 million. 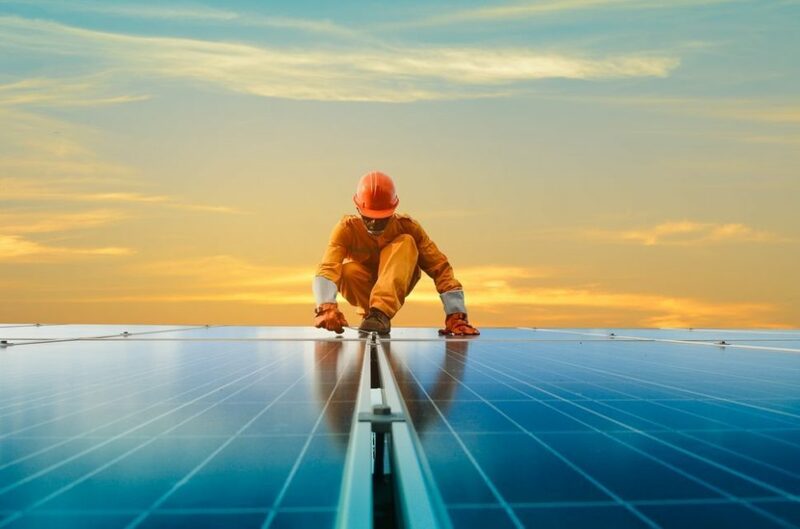 The biggest renewable energy employer is photovoltaic solar which, up 12% from 2015, provided 3.1 million jobs, mainly in China, the US, and India. Liquid biofuels were responsible for 1.7 million jobs. Thanks to new installations (in the United States, Germany, India, and Brazil) the wind sector (+7%) created 1.2 million jobs. Solid biomass was responsible for 700,000 new jobs, and for biogas, 300,000 new jobs. The current state of renewables is due to the growth in investments, which are a direct result of falling costs and the adoption of favorable policies by most countries. And that seems to be the case for Asia and China in particular, where 3.6 million people worked in the sector in 2016, which constitutes 21% of global renewable energy jobs and a large chunk of renewable energy job creation. Accounting for 62% of total renewable jobs–-compared to 50% in 2013-–Asia and China are continuing to create and sustain most of the world’s renewable energy development. Asia (China, Japan, India, Malaysia, and Thailand) has become a mecca for the manufacture and installation of photovoltaic systems. Other countries ranking high on the list are: Brazil (876,000 jobs), the United States (777,000), India (385,000), Japan (313,000) and Germany (334,000). Renewables are so inefficient that expanding them amounts to Energy Feudalism. Back in the day, it took 20 people to grow enough food for 22 people. 20 were the serfs, the other 2 were the nobility. Renewables will require a gargantuan national workforce whose task will be to produce enough energy, so we can keep the lights on and the factories running so we can produce enough energy… to produce enough energy to keep the lights on. We’re not hamsters, or serfs. Our national energy system should be as efficient as modern agriculture – 1-2% of the population works to feed the entire country, so the rest of us can get on with the job of keeping a complex and advanced society afloat. We can run the entire country on 1,500 1-GW reactors, with a minuscule work force (far less than 1-2% of the population), on land equivalent to half of Long Island. Renewables are a roadmap to nowhere. The following are my personal opinions. I have to agree that safe nuclear energy is a more efficient energy solution. Yet, in your analogy, whatever percentage of non-energy-producing people renewables provide for would still be the “nobility,” except that in our capitalist republic, those people would also, presumably, be providing goods or services to the people who do provide renewable energy. In order for a renewable energy sector to resemble feudalism, you would have to assume that the people producing the energy are not pursuing their own personal fortunes, and instead simply “working the land” to surrender profits to the nobility. The pushback on most alternative energy fronts is not ideal. Bottom line, opponents of the proliferation of safe nuclear energy lobby against it for the same reasons they lobby against renewables: to protect their profits. For better or worse, the people producing and installing renewable energies are trying to do the same thing. Compared to nuclear, producing energy from renewables seems Sisyphean. Yet, what would it take for nuclear to be adopted immediately? If all of the labor force dedicated to renewables instead focused on solutions to the portability, expense, and waste problems of nuclear energy, would we be able to move away from high-carbon fuel sources immediately? Personally, I think no. I think the production of renewables is good for humanity on multiple levels. For one, in the short term, people have jobs. What’s more, by focusing on cleaner energies we are acknowledging that our impact on the environment needs to be considered much more seriously and on a larger scale.